U.S. stocks plunged with the Dow, shedding more than 300 points, suffering the worst single day performance of the year. Despite the 300-plus point loss, both the S&P 500 and Nasdaq saw higher losses on a percentage basis as the CBOE Volatility Index surged over 24 percent to 18.76. Investors and traders are paying close attention to global economic data, especially out of one of Europe's most important economies, Germany. Data released prior to the U.S. market open showed a 5.8-percent drop in German exports in August. Not helping the bulls, the European Central Bank's President Mario Draghi hinted that the eurozone's economic growth is slowing and central banks should strive to raise inflation. On the domestic front, the Fed's John Williams said "we need strong stimulus to keep economy on track" and that the first U.S. rate hike may occur in mid-2015. The Dow lost 1.97 percent, closing at 16,659.25. The S&P 500 lost 2.07 percent, closing at 1,928.21. 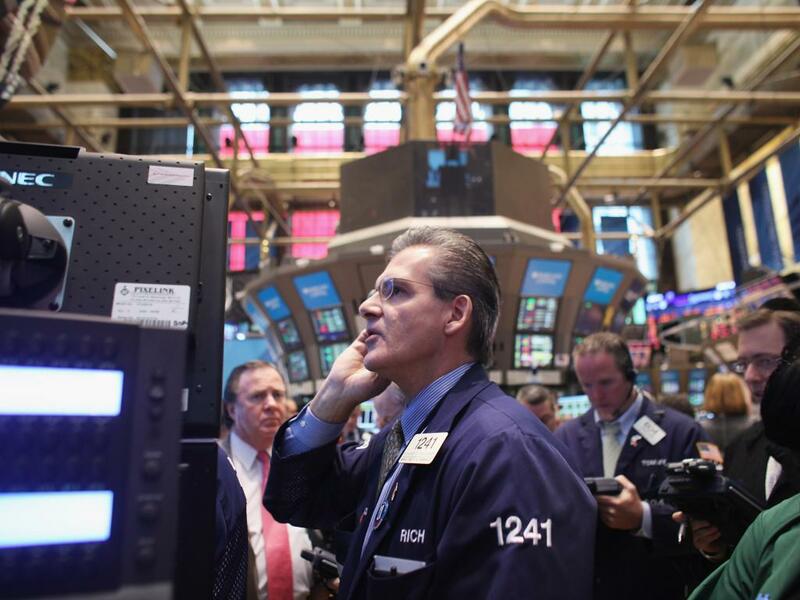 The Nasdaq lost 2.02 percent, closing at 4,378.34. Gold gained 1.55 percent, trading at $1,224.70. Oil lost 2.35 percent, trading at $85.26 a barrel. Silver gained 1.79 percent, trading at $17.37 an ounce. Initial Jobless Claims fell 1,000 to 287,000 (versus consensus of 293,000) while continuing claims fell 21,000 to 2.38 million. August Wholesale Trade Inventories rose 0.7 percent (versus consensus of 0.3 percent gain) to $538.0 billion. Sales fell 0.7 percent to $453.9 billion while inventory to sales ratio read 1.19. EIA Natural Gas Inventory rose 105 bcf after rising 112 bcf last week. ICSC is forecasting holiday retail sales will rise 4 percent this year. Analysts at Oppenheimer upgraded Acuity Brands (NYSE: AYI) to Outperform from Market Perform with a $160 price target. Shares lost 2.27 percent, closing at $128.99. Analysts at Macquarie initiated coverage of Alibaba (NYSE: BABA) with a Neutral rating and $88 price target. Shares gained 0.55 percent, closing at $88.79. Analysts at Barclays maintained an Equal-weight rating on Anadarko Petroleum (NYSE: APC) with a price target lowered to $112 from a previous $126. Shares lost 6.18 percent, closing at $90.00. Analysts at Oppenheimer upgraded Apple (NASDAQ: AAPL) to Outperform from Market Perform. Shares gained 0.22 percent, closing at $101.02. Analysts at RBC Capital initiated coverage of Dow Chemical (NYSE: DOW) with an Outperform rating and $66 price target. Shares lost 3.54 percent, closing at $48.23. Analysts at Barclays maintained an Overweight rating on EOG Resources (NYSE: EOG) with a price target lowered to $130 from a previous $148. Shares lost 2.75 percent, closing at $91.96. Analysts at Bank of America maintained an Underperform rating on The Gap (NYSE: GPS) with a price target lowered to $38 from a previous $42. Also, analysts at Nomura maintained a Neutral rating on The Gap with a price target lowered to $43 from a previous $50. As well, analysts at Canaccord Genuity maintained a Buy rating on The Gap with a price target lowered to $49 from a previous $50. Shares lost 12.49 percent, closing at $36.67. Recommended: Deutsche Bank Recommends The Boeing Company, General Dynamics Corporation And Rockwell Collins, Inc.
Analysts at Barclays maintained an Overweight rating on Mobileye (NYSE: MBLY) with a price target raised to $66 from a previous $49. Shares lost 2.82 percent, closing at $54.49. Analysts at Nomura maintained a Buy rating on Netflix (NASDAQ: NFLX) with a price target lowered to $425 from a previous $455. Shares lost 1.12 percent, closing at $461.62. Analysts at Nomura maintained a Buy rating on Qualcomm (NASDAQ: QCOM) with a price target raised to $90 from a previous $85. Shares lost 1.48 percent, closing at $74.08. Analysts at Bank of America Upgraded Toyota Motor (NYSE: TM) to Buy from Neutral. Shares lost 1.50 percent, closing at $114.52. Analysts at Nomura maintained a Buy rating on Twitter (NYSE: TWTR) with a price target raised to $55 from a previous $50. Shares lost 0.23 percent, closing at $55.29. Carl Icahn wrote a letter to Apple's (NASDAQ: AAPL) CEO Tim Cook encouraging the company to accelerate its share buyback. Icahn said that shares of Apple are undervalued and are worth $203 per share on projected fiscal 2016 and 2017 earnings. Icahn also encouraged Apple to explore an UltraHD TV set. Shares of Apple gained 0.22 percent, closing at $101.02. L Brands (NYSE: LB) reported its September same-store sales rose 6 percent. Total sales rose 9 percent from a year ago to $853.5 million. Shares lost 0.63 percent, closing at $67.41. Allergan (NYSE: AGN) said that it expects its third quarter non-GAAP earnings per share to be $1.76 to $1.78 with net sales growth being higher than 17 percent. For the full year 2014, the company expects an EPS of $6.20 to $6.25. 2015 EPS is guided to be approximately $8.60 while 2016 EPS is guided to be approximately $10.25. Shares hit new 52-week highs of $192.98 before turning negative and closing the day at $187.55, down 1.55 percent. According to dealReporter, several companies may be interested in acquiring VMware (NYSE: VMW). Shares lost 0.26 percent, closing at $92.74. According to The Wall Street Journal, Amazon.com (NASDAQ: AMZN) will open its first store in Midtown Manhattan in time for the holiday shopping season. The store will serve as a mini-warehouse that could serve as a base for limited same-day deliveries within the region. The store could also be used as a showroom for Amazon's hardware devices. Shares lost 2.27 percent, closing at $315.37. Liberty Media's (NASDAQ: LMCA) CEO Greg Maffei said that it may consider exiting its position in Expedia.com (NASDAQ: EXPE). Shares of Liberty Media lost 2.71 percent, closing at $45.23 while shares of Expedia lost 1.82 percent, closing at $83.83. Riverbed Technology (NASDAQ: RVBD) lowered its third quarter earnings per share guidance to a range of $0.30 to $0.31 from a previous $0.30 to $0.32. The company now expects its revenue to be $276 million to $277 million compared to a previous guidance of $285 million to $291 million. The company said that it will begin a review of strategic alternatives but offered no further information. Shares gained 2.82 percent, closing at $18.59. Auxilium (NASDAQ: AUXL) has agreed to be acquired by Endo International (NASDAQ: ENDP) for $2.6 billion or $33.25 a share. Auxilium investors could elect to receive the entire amount in cash or 0.488 Endo shares for each share of Auxilium owned, or any combination of cash and stock. Shares of Auxilium hit new 52-week highs of $33.00 before closing the day at $32.44, up 9.01 percent. On the hand, shares of Endo fell 5.94 percent, closing at $66.78. A lawyer for GT Advanced Technologies (NASDAQ: GTAT) requested that the company's bankruptcy details remain confidential. Shares gained 17.27 percent, closing at $1.29. 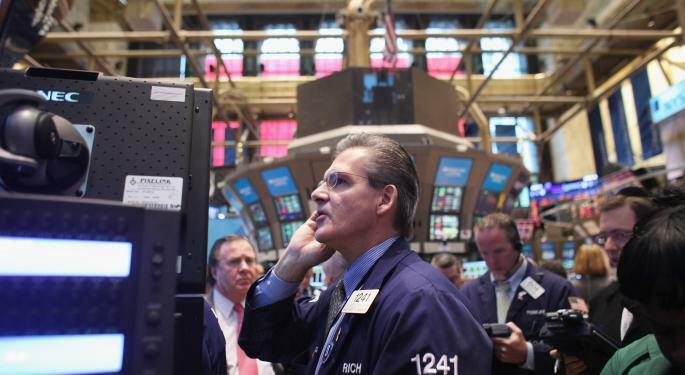 Companies linked to Ebola continued to see their shares surge on Thursday. AlphaPro Tech (NYSE: APT) hit new 52-week highs of $5.08 before closing the day at $4.84, up 27.70 percent. Shares of Lakeland Industries (NASDAQ: LAKE) hit new 52-week highs of $19.79 before closing the day at $17.72, up 52.50 percent. Impax Laboratories (NASDAQ: IPXL) has acquired Tower Holdings for $700 million in cash. The company estimates that the acquisition will add $0.90 to its earnings per share in 2015. Shares of Impax gained 11.79 percent, closing at $26.65. After the market closed Wednesday, The Gap (NYSE: GPS) stated its CEO Glenn Murphy will resign in early 2015. At the same time, the company said that its sales rose 1 percent in September to $1.48 billion while comp sales were flat. The company also expects its gross margin rate will decline in the third quarter compared to last year. Shares lost 12.49 percent, closing at $36.67. K12 (NYSE: LRN) issued full-year fiscal 2015 guidance and expects its revenue to be in a range of $925 million to $950 million. The company also sees its operating loss worsening to $11 million to $16 million compared to an operating loss of $8.5 million in the first quarter 2014. The company noted that a growing demand in virtual education is affecting ongoing enrollment figures. Shares hit new 52-week lows of $14.53 before closing the day at $14.87, down 7.0 percent. WPX Energy (NYSE: WPX) announced a new strategy that will simply its geographic focus and expand returns, margins and cash flow over the next five years. The company plans to make changes to its capital efficiency, oil growth as well as scalability. The company will narrow its focus to several properties including Williston, San Juan and Piceance basins, which holds 16,000 drillable locations. Shares lost 8.46 percent, closing at $19.73. Yesterday, analysts at Bank of America expressed concern of Alcatel-Lucent's (NYSE: ALU) ability to deliver on its 2015 revenue estimates given a weak environment given concerns over poor telecom capital expenditures. Shares hit new 52-week lows of $2.53 before closing the day at $2.57, down 9.51 percent. After China said it will impose three percent to six percent tariffs on coal as of October 15, shares of Teck Resources (NYSE: TCK) fell sharply. The company's sales to China accounted for more than 26 percent of 2013 revenue while coal sales represented 44 percent of the company's overall revenue. Shares hit new 52-week lows of $16.03 before closing the day at $16.15, down 7.18 percent. Other coal names also fell including Peabody Energy (NYSE: BTU) as shares hit new 52-week lows of $10.15 before closing the day at $10.24, down 9.22 percent. This morning, PepsiCo (NYSE: PEP) announced its third quarter results. The company announced an EPS of $1.36, beating the consensus estimate of $1.29. Revenue of $17.22 billion beat the consensus estimate of $17.16 billion. Net income for the quarter rose to $2.0 billion from $1.9 billion in the same quarter a year ago as the company saw its volume rise by one percent in both the snacks and beverages segments. Pepsi issued guidance and expects its 2014 EPS to grow nine percent. Shares lost 0.39 percent, closing at $93.57. After the market closed, Family Dollar (NYSE: FDO) reported its fourth quarter results. The company announced an EPS of $0.73, missing the consensus estimate of $0.77. Revenue of $2.61 billion beat the consensus estimate of $2.58 billion. Shares were trading lower by 0.32 percent at $77.50 following the earnings report. “It's conscious capitalism, not quarterly capitalism.” - Container Store (NYSE: TCS) CEO Kip Tindell saying he may no longer issue guidance as traders and investors may ignore the company's long-term prospects in favor of the short term.